More information: the major portions (shell, underbelly, flippers/feet) are Japanese weaves with washers used as the horizontal/flat rings. The washers are overlapped to give a scaled look. the shell is Japanese 6-1 with the washers overlapped in a shingle sort of pattern which radiates out from one washer at the center. This creates a natural sort of dome/shell shape. 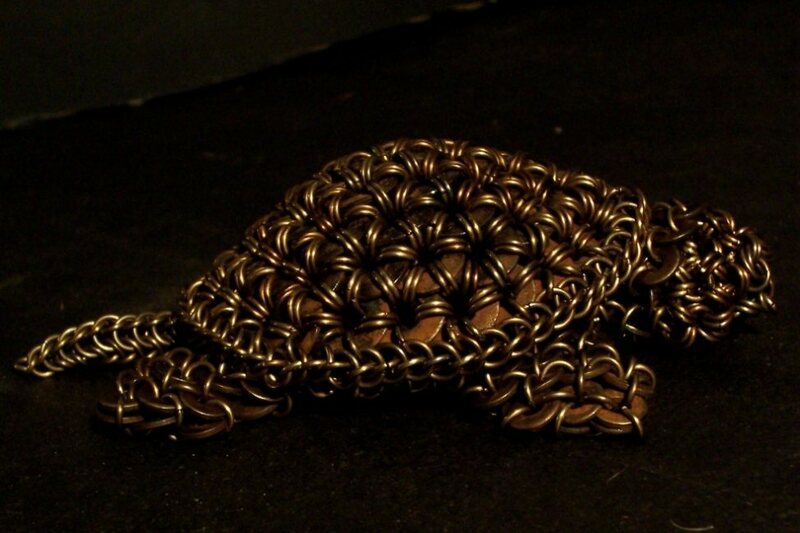 The shell is trimmed with Half Persian 3-1, which acts as a decorative trim and provides attachment points for other parts of the turtle's body. 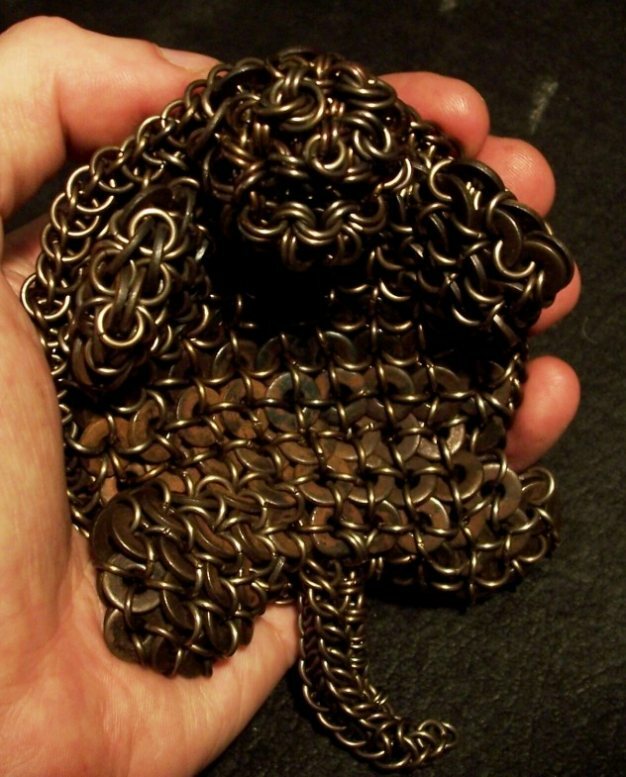 The body and feet/flippers are jap 4-1, made with smaller washers (maybe about 1/4" diameter), with the overlaps positioned so the washers lay like scales. 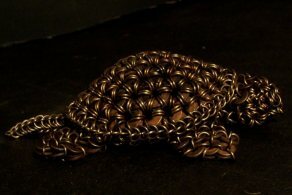 There is no stuffing inside the turtle to help it keep any sort of shape, though a fairly thick weave (made of steel lockwashers) which I believe is called coyote-maille was used as an anchor point for the top parts of the feet, the head, and tail. The head is tailored/sculpted Japanese Cube with small Mobius Balls for the eyes and nostrils. The mouth opens and closes, and some people say it smiles. The tail is a triangular cross sectioned hybrid of Half Persian 3-1, European 4-1, and Japanese 1-2-1 linkages. Materials are as follows: .045" diameter stainless steel wire for the standard type of maille rings, ID of ranges from 1/8" to about 1/4". Washers were galvanized steel, and some steel lockwashers were used in a structural weave on the inside of the body. A propane or MAPP torch was used to heat oxydize/blue the whole thing (which turned the stainless rings a dark bronze color) when it was finished. A very light layer of surface rust has formed on the blackened washers which gives a brownish look in some lighting.